Kids can row too, and they love it! Kids can row too, and they love it! 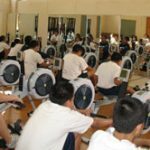 Working out on a rowing machine has been found to strengthen cardiovascular performance, build fitness among kids at all fitness levels and improve classroom performance and behavior. 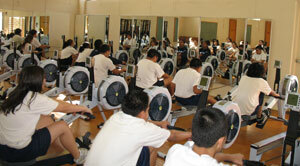 Schools that have introduced rowing to their P.E. classes report that the machine is among the best fitness equipment investments they’ve made. Whether for schools looking to introduce rowing, or others wanting to reinvigorate their existing rowing machine workouts, UCanRow2 offers custom trainings and programming consulting that can help you make the most of your investment and get the best results for your students and teachers. The training is provided by UCanRow2’s Terry Smythe, a Concept2 master instructor who has worked with dozens of schools around the country. For more information or to set up a training or programming consulting for your school contact us.